15mm wheel spacers for your MINI Cooper. 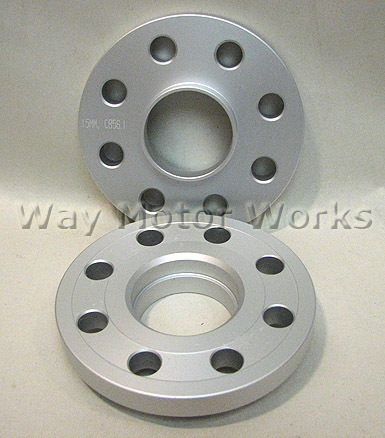 WMW wanted to make the best wheel spacers available. So these 15mm all aluminum spacers have been cut perfectly to be an exact hub-centric fit. The holes for the wheel bolts or studs will fit both 12mm and 14mm bolts. But here is where we went a little further. We anodized them in a silver, then cut the center bore to be hubcentric Then the flat surface has a slight recess in it to prevent any corrosion from making them stick to the rotors. Stock lug bolts are too short to use with these. Sold in pairs of 2 spacers. Will fit all MINI's with 4 bolt 4x100 bolt pattern.